Last week something else got ticked off my bucket list, a visit to The Empty Quarter, one of the largest sand deserts in the world bordering Oman, Yemen, Saudi Arabia and my country of residence, the United Arab Emirates. Over my 9 years in the UAE, I have spend quite some time taming dunes in 4x4's closer to Dubai, but this definitively steps it up a notch! Three hundred feet dunes, one after the other, covering an amazing 650.000 sq./km., more than the total area of Belgium, the Netherlands and France together. 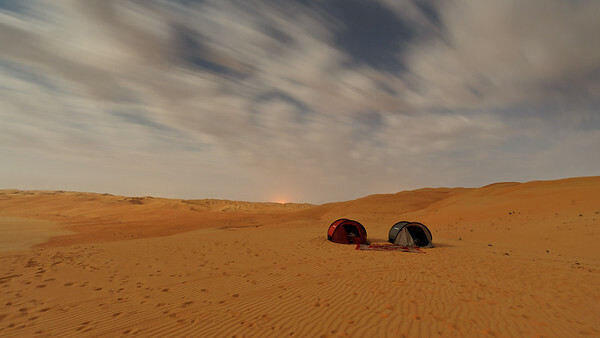 The easiest way of getting to The Empty Quarter from Dubai, ( called Rub' al Khali in Arabic ), is a 3 to 4 hour drive to Liwa, a 100km wide East-West oasis close to the Saudi border. 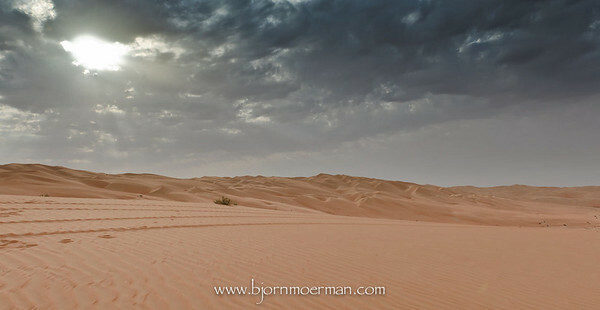 We went out there with three 4x4 cars and camped 2 nights in the desert wilderness. Surprisingly we actually had quite a bit of rain during the night and early mornings. According to a local camel farmer, this occurs once every 5 to 10 years! One of our fellow campers who is an experienced paraglider, brought his parachute on the trip. 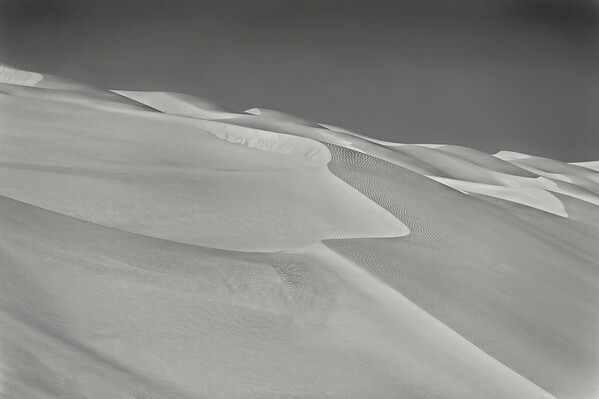 A 15 knot wind blowing over the dunes, made for good slope soaring conditions. Just after landing in one of the many dry lake beds, this camel looked very surprised to this crazy creature coming from the sky! While camping under a full moon, I shot this midnight shot of two of our tents. On the way home we stopped at Moreeb dune, Arabic for scary mountain! 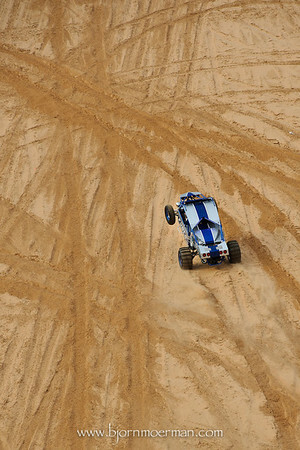 It is a 120m high dune with a 50 degree upslope where locals race cars, dune buggies and motorbikes. Even though I did not shoot as much as I had in mind, it was a great escape for a few days. Highly recommended! 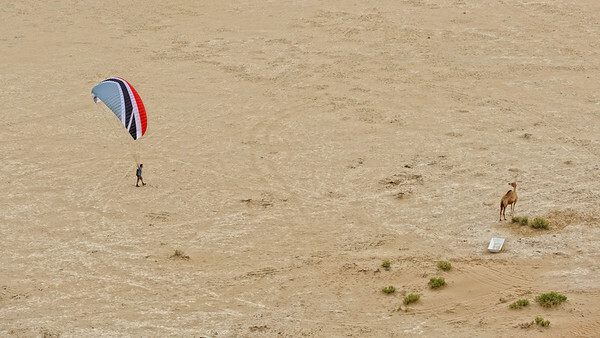 Earlier this month, I attended the 2011 Dubai International Parachuting Championship near Dubai Marina. 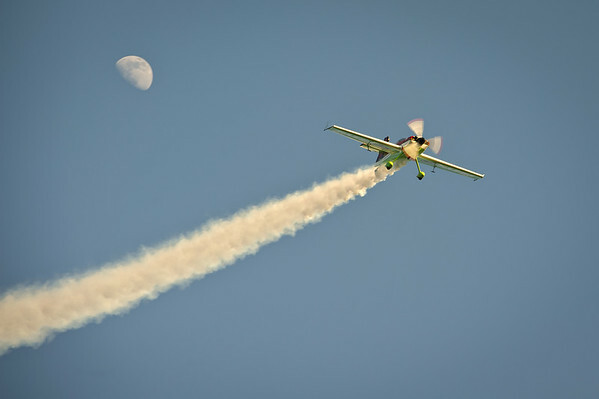 At the end of the day, Hungarian pilot Veres Zoltan, showed his MXS in a breathtaking aerobatic display! My favorite frame is this one of the rising moon during Veres his amazing performance. Shooting fast moving propeller aircraft is always a bit of a challenge. Because we don't want to stop the propeller in flight, one needs to use a shutter speed of 1/320 or slower. Panning is pretty much the only option under these conditions. Next week will be a great opportunity to try out techniques like the above during the 2011 Al Ain airshow, 1 1/2 hour away from Dubai! More images made at Skydive Dubai can be found here. 2011 Pic(k) of the week 3: Use what you have! Last week I flew into Dhaka, the capital of Bangladesh, one of the worlds most populated and poorest countries bordering India and Burma. While waiting for our return flight passengers, we watched as two young Bangladeshi were painting the airport terminal. Witnessing scenes where people do the job with whatever is available, continues to amaze me. 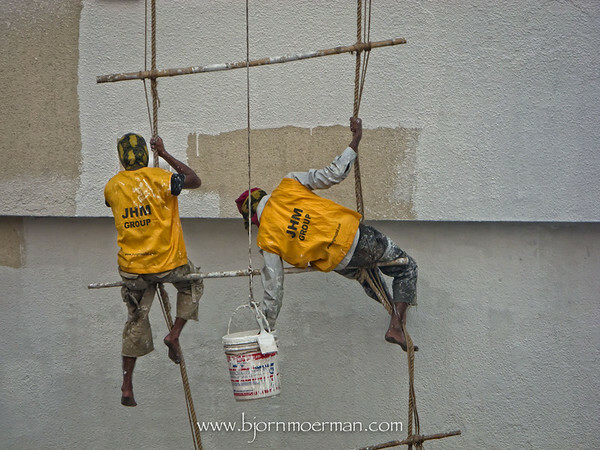 I'm sure work safety organizations back home, would be astonished by the above, but it does do the job! Unfortunately my day job has kept me extremely busy the first month of this year. 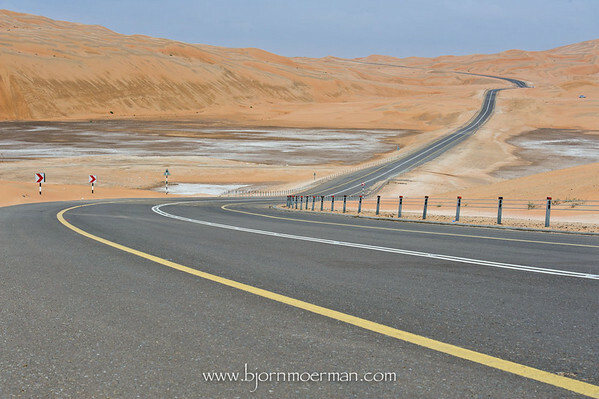 I hope to decrease the backlog of images to be processed, including some of a recent trip to Liwa (The Empty Quarter desert) towards the end of the month. One of my favorite places in Dubai to shoot environmental portraits is the Dhow Wharfage at Dubai creek, Deira site. It is all about the hustle and bustle of loading and unloading Dhows. These old wooden boats are used on a daily basis to transport goods from/to Iran, Pakistan and India. Seeing this is a must for everybody visiting Dubai. On a recent visit, I photographed this gentlemen waiting for somebody at the Dock of the Bay. Connecting this to the famous 1967 song "Sitting on the Dock of the Bay" by Ottis Redding, was a no brainer! More Dhow Wharfage images can be found here. Since late 2009, I've been taken portraits of the men working at the Dubai Fish Market. Before my next visit, I make prints and then hand them out for free whenever I return. For most of these men it is the first time they receive a printed photograph of themselves... The smiley faces when I walk into the market with a fresh stack of images, really make my day! Because the project is so close to my heart, I really think it deserves a separate gallery. 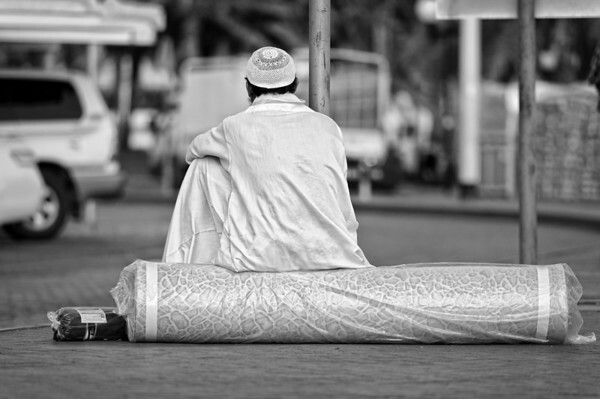 So welcome to my brand new: "Faces of the Dubai Fish Market" gallery! Personal photography projects are vital to get the motivation going and are also perfect to become inspired. The Faces of the Dubai Fish Market is definitively no exception! As promised I'm continuing my Pic(k) of the week series in 2011. During the first week of the year, my brother in law, a brand new DSLR photographer and fellow Nikonian (D90), was over on a visit with his spouse. I really enjoyed teaching him the basics of night and landscape photography and introduced him to Lightroom 3 post-processing. It kind of felt like a one on one photography workshop. At some stage, I would love to do this more frequently! One of the last outdoor trips we took was to the Hatta pools area. 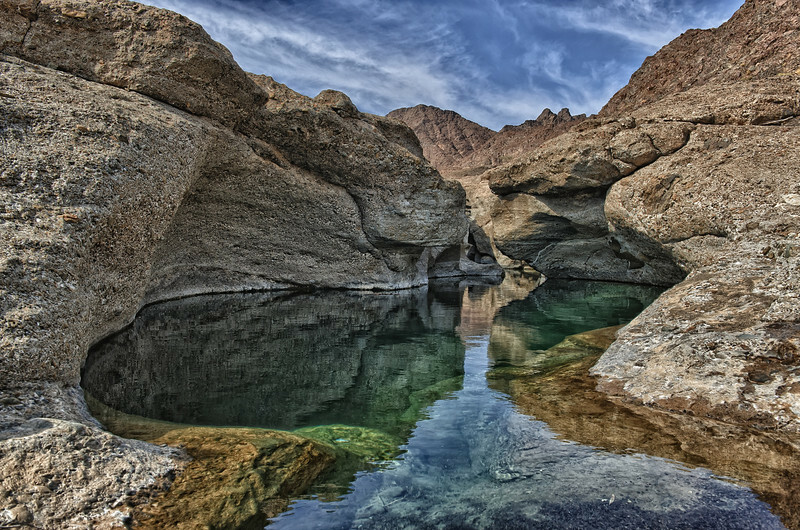 This is a mountainous area about 1hr30 from Dubai, where one finds multiple natural water pools. Unfortunately the more popular pools are often full of garbage. Common for the region, "some" people tend to think that they can just leave garbage behind and nature will take care of it... You should all be ashamed! Off the beaten track, we did however also spend time at relatively clean places. Deeply hidden into the mountains, we were surprised to find this beautiful lonely mosque. A good start of a new photography year! More of the Hatta images will be uploaded here. Photography wise, 2011 started very well! I'm delighted to be the winner of the photo competition in the renown aviation magazine, "Flight International! The winning image of a friends YAK 52 over the white cliffs of Dover (UK) can be found on page 23 of the 21 Dec 2010 - 03 Jan 2011 edition of the worlds best known aviation magazine. The competition consisted of 4 categories while the image above won the first prize in the "General Stars" section. As an afterthought, I wish I had not entered the competition with my nickname (Biggles)... Next time better! If you haven't done so yet, please check-out my Aviation Portfolio gallery.